From the kitchen of One Perfect Bite...I met for a last lunch with Mrs. S. before Bob and I made the big move from Chicago to the East Coast. It was a small gesture to thank her for all she had done for me through the years. We met in an Italian restaurant and spent a loud and lovely afternoon laughing and retracing the path through the field of memories we shared. Within the year her great heart would seize and surrender, a passing that was quick and painless for her but left those who loved her reeling. On that day, however, we spoke of things silly and serious. Among the silly, were her thoughts on my choice of pasta. She insisted it was not Italian. Turns out she was right. I was having a prototype of what would become penne with vodka sauce and part of the nuova cucina that raged across the United States in the 1980's. Vodka is not native to Italy and it wasn't distributed there until the latter portion of the 1970's. It's thought that vodka sauce for pasta was probably developed to attract people to the beverage. We know that vodka sauce was invented at Dante, a restaurant in Bologna, Italy, but Joanna's Restaurant, in New York City, is credited with beginning the fad for vodka sauce in the United States. Several years ago, I developed a recipe for a competition that used a vodka cream sauce. A few of you may have seen it on the Better Recipes website. It won no prizes, but it is one of the best recipes I've developed. I'm proud of it on several levels. While expensive to make, it is very easy to do and, with all due modesty, I'll tell you it's absolutely delicious and perfect for family or guests. Mrs. S. would be proud to see that all those hours she spent with me weren't wasted. Here's the recipe. 1) Heat oil in a 12-inch skillet, large enough to hold ravioli and sauce. Add red pepper flakes and saute for 30 seconds, or until fragrant. Remove pan from heat and carefully add vodka. When pan has stopped sizzling return it to a burner set on medium-high heat and cook until vodka has nearly evaporated. Add cream and bring to a boil over high heat. Add salmon, reduce heat to very low and simmer gently for 5 minutes. Remove from heat and allow the salmon to steep and infuse the cream. Salt and pepper to taste. 2) Meanwhile, bring a 6-quart pot of water to a boil. Salt water, add ravioli and cook, per package instructions, until just until tender. Drain. 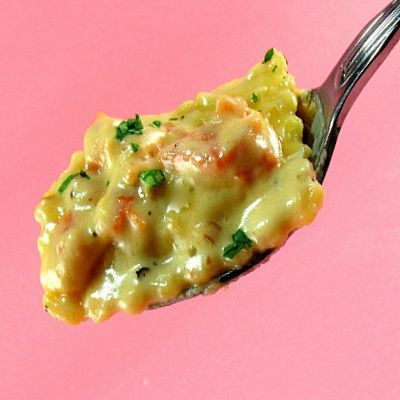 Add ravioli to salmon-cream mixture and toss gently to coat. Evenly divide ravioli among 4 shallow pasta bowls; spoon any additional sauce evenly over pasta. Garnish with minced parsley and serve. Yield: 4 servings. It sounds amazing and I love the salmon in here. It is great because one can talk for hours about all these possibilities!!!! Haven't try making my own ravioli yet but will soon. I love any kind of pasta. So, this looks yummy to me! Gosh this looks amazing--so creamy, decadent and good! The sauce looks and sounds great! I've heard a lot about vodka sauce but have never tried it, I have to! Vodka sauce sounds adventurous! :) I must try this! Mary, I think, secretly, I have been looking for this recipe for a long time. We have tried several vodka sauces and some were ok and then there was the one that was so-so. I know if you say this is good, IT IS GOOD!! Loved your story, once again. Mary, what an interesting story about the vodka sauce and Mrs. S. touched my heart. Happy pink Saturday. Mary, of course I'll visit you! I know I haven't been here lately but I tell you...this ravioli is giving me a hankering for some pasta! Oh my gosh! Is that like the most tempting forkful! I love Penne Vodka so I am quite sure I would love your dish Mary. It sounds abosolutely delicious. Hmmm Absolute- isnt that a brand of vodka. Congratulations on winning! I am off go check out your link. Fabulous post Mary! Loved the story. I can't wait to try your recipe. It looks really really good. Thanks so much for sharing this and the history. Hi Mary - this recipe looks fabulous!! You must be so proud!! I will most certainly save and make this recipe. My older boys will love it! They actually both like to cook and we enjoyed making a few meal together over Christmas when they were home from college (including penne alla vodka). I am HUNGRY and these looks so delicious!! My favorites, salmon, ravioli. Hmmmm the vodka cream sauce . . . I'll have to see if I can get hubby to make this! I've already printed this out, Mary. Your vodka sauce sounds so delicious with smoked salmon and cream. I can't wait to try it. Wonderful, what a treat! Perfect for a special occasion. It must be ravioli week. I am posting some tonight and I just watched Bobby Flay's ravioli throw-down. o, Sweet Mary...visiting you always leaves my mouth watering for the beautiful foods you prepare. Tell me, dear heart, do you EVER have just hot dogs or cereal or bacon and eggs? Your meals are so beautiful and so delicious sounding. I wonder how I've gone this long in life without the BEAUTIFUL foods. Mine are all so common..uninteresting.. I just haven't taken the time to learn to cook like this...my loss !! i love vodka sauce..never had it with salmon... this recipe looks divine... I shall try it!!! 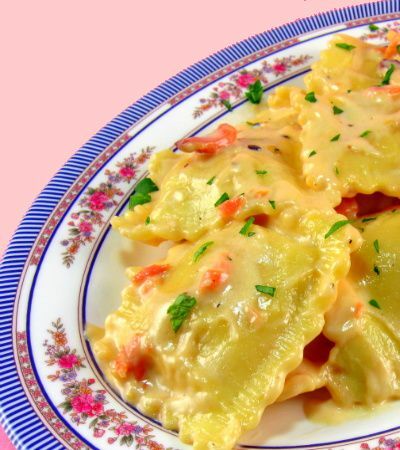 Vodka sauce is one of my favorites and I can only imagine how delicious it is paired with ravioli and smoked salmon (two of my other favorites). I loved the story you told to accompany this. Mrs. S sounds like a great person. I only hope that when I pass, someone dear to me describes my life and passing so poetically. This is lovely is many ways Mary. Thank you. Lynn, you could substitute half-and-half for half the heavy cream. Ohhhh ooooooo ahhhhh. So heavenly looking, sounding, and tasting I have no doubt. Are you sure you don't have a crew there helping you? I swear you are super woman Mary. I just have no idea how you crank this all out and still live your life! It looks (and sounds) fabulous! I like vodka anyway, and I can see how it would work with pasta without overwhelming it. Happy Pink Saturday, and Happy New Year! Mary, this looks and sounds absolutely divine!! I've used a vodka cream sauce on other dishes but this really has piqued my interest!! Laura, I was born a multi-tasker :-). OOOOOO, those cinnamon rolls (previous post) sound awesome, too! Oh, that looks and sounds delicious. And it's perfect for Pink Saturday! What a lovely and touching memory of your friend. It makes me even more eager to try the sauce. What a beautiful story and a great recipe, Mary. Myfirst visit to your blog - it is WONDERFUL! Love this fabulous recipe! Thanks! Hello Mary, I had to stop over and see what you are up to. Busy, busy I see. I am going to use your vodka cream sauce recipe tomorrow for a luncheon for friends. I will be stuffing mannicoti with roccota ( I see I must have too many n's or c's but that is neither here or there) and using your sauce and shrimp to top it all off. I'll try to remember to take pictures but you know how that goes when the food is on the table. Thank you my friend. cant go wrong with smokes salmon! I cant believe it didnt win - it looks amazing! It looks delicious. I didn't know the story of its origins - how interesting! Happy Pink Saturday! Yum, I will definitely try this one soon - looks and sounds delish!! Thanks for sharing. I never knew the history on vodka sauce, and now I do! I'd love to make this dish for our friends, who don't eat red meat. Perfecto! This looks delightful! I've never tasted vodka cream sauce but I can tell from the list of ingredients that it would be an instant favorite! Yum! Wow, this looks amazing. What a perfect blend of ingredients and spices. I have to tell you that I want to get out of my chair right this minute and prepare this. OMG, it sounds like something we would love. And, it seems so easy. This has to be a winner!!! I'm a day late and a dollar short with my Pink Saturday visits. The sun was shining too bright yesterday and just like a little kid I couldn't stop marveling at how lovely it was as it beamed through my lace curtains and puddled on the floor. My cats were in heaven. So, here I am today, a little late but thinking that I got a bonus because I avoided all the traffic! Lovely blog and the sweetest pinks that you shared. Thank you so much for making this such a lovely Sunday for me. Oh ma gosh, my mouth is watering over that pasta! Just popped over to wish you a happy pink Saturday! Sounds lovely! I never thought about adding salmon with ravioli. Oh congratulations on the new addition to the family. How perfect for Christmas. Wishing your family a blessed New Year! LOOKS so Yummy! Happy belated PINK Saturday! This looks quite delicious. I love the combination of pasta and smoked salmon. Lovely blog. Gorgeous list of ingredients. And I have always wanted to make penne with vodka cream sauce but this looks and sounds even yummier! Love the smoked salmon added to the combo. Gorgeous, Mary!